I Was Here is so incredibly readable. I opened it up and suddenly I had zoomed through a third of the book. Bravo Gayle Forman for grabbing me and hooking me. Cody's best friend committed suicide and now she is picking up the pieces of Meg's life. Meg always shone brighter than Cody, but hid a dark side that comes to the surface when Cody starts to investigate her death. I wanted to know more about their relationship and why Meg would choose to end her life. I found their friendship to be believable and perfect for the small town setting. I was disappointed by the romance in the book. I understand that the target audience is young adults, but it felt inauthentic for Cody to fall for this guy who seemed fairly unlikable and was involved with her dead friend. Ben just didn't have enough of a spark to make that big leap. The only thing I can think of is that her mother has terrible taste in men and Cody shares it. The story didn't need Cody and Ben to fall in love for people to read it. 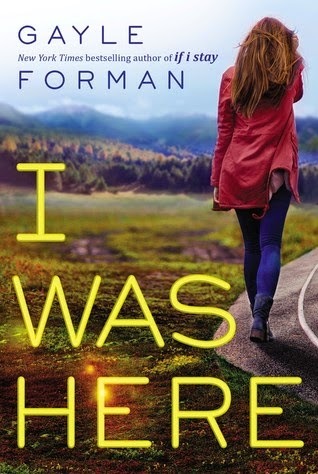 I Was Here isn't on the same level as If I Stay, but it was the most engaging book I've read lately.